Welcome to the Sustainable Minerals Institute’s new look e-Newsletter - the purpose of which is to share our research, events and news. For many of us, the start of 2019 has been overshadowed by the tragic disaster at the Feijão mine in Brumadinho, Brazil. It is difficult to adequately describe the horror of such an event, and we express our condolences to all those who have lost their lives. We do not yet know the causes of the tragedy, but it is a sober reminder of the amount of work that is still required to find safe and sustainable ways to deal with mining waste. The Sustainable Minerals Institute invites partners to join with us on a Global Tailings Research Consortium to accelerate this transition, and we will be sending out details on this initiative in the coming weeks. Reflecting on the past year, SMI can be proud of the progress made in so many aspects, and I would like to thank everyone for their contribution towards making SMI a great place to work. In line with The University of Queensland's five-year strategic plan, our operational plan delivered on the three long-term objectives: game-changing people, partnerships and global impact. Furthermore, our focus on delivering high quality research in core disciplinary areas across the six research centres has resulted in solid growth for demand of our expertise. We were delighted to see mining and mineral engineering at the University ranked number one in the world in the Shanghai Ranking - testament to the deep technical knowledge we have at UQ and to our ability to find solutions to the sustainability challenges of the global minerals industry. We initiated the first of five trans-disciplinary strategic research programs, “Unlocking complex orebodies”, with the objective of building meaningful long-term research partnerships that can address global issues in the resource sector, as well as providing an opportunity for future talent to think deeply about the challenges facing the resource sector. The strategic funding we received enabled us to host the former President and CEO of ICMM, Dr Tony Hodge, for three months as a visiting academic. Tony’s contribution and impact will ripple through SMI for many years to come as we respond to his thought-provoking challenges. Our focus for this year is to further strengthen the research centres, and initiate the remaining four programs: transforming mine life-cycles; driving sustainability through governance and leadership; digital mining to improve process efficiency and manage social risks; and creating the leaders of the future through transformational learning. As part of this process we welcome SMI Professor Daniel Franks, who many of you may remember worked with us until 2015, before taking up an appointment with the United Nations Development Programme, to lead the ACP-EU Development Minerals Programme. Daniel will be heading up the Governance and Leadership strategic program. We also welcome Brett Garland to SMI. 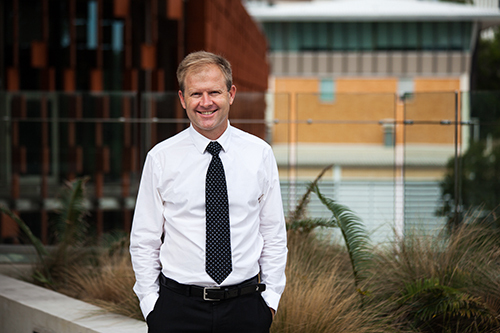 Brett has a long and highly regarded career in mining safety, and we are delighted that he has joined us as the Director of the Minerals Industry Safety and Health Centre (MISHC). It is also very encouraging that many of our partners are investing in the development of future leaders, who can create change for responsible resource development. We are very excited by the partnership with Newcrest to develop a cohort of UQ Industrial PhDs. Internationally, we have focused on creating a world leading “International Centre of Excellence” in Chile, which has now been extended for another 3 years. We are also extending our activities in India and Africa. We have the disciplinary expertise (breadth and depth) to have a profound impact on the future of the resource sector if we all work together to share our different perspectives, learn from each other and co-create a different future. I have a vision for the future of mining, and it resides in the leaders we are developing. I hope you enjoy our enewsletter, this is a new initiative for us so please feel free to send through your feedback and suggestions to our marketing and communications team.